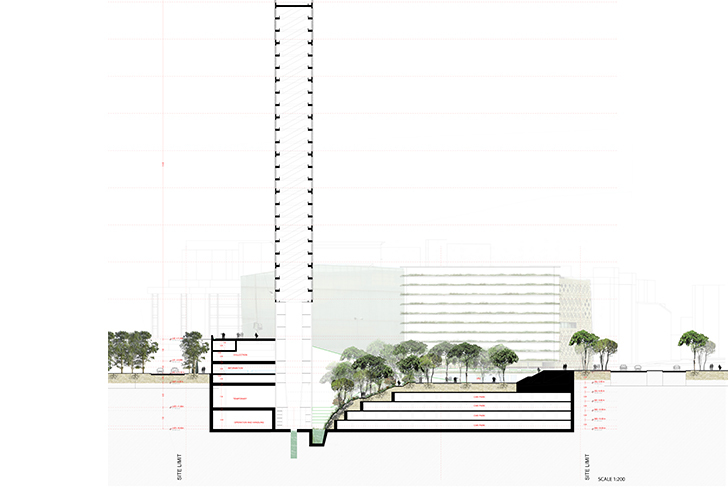 The landscape project for the new Beirut Museum of Art (BeMA) provides a unique opportunity for furthering the urban transformation process initiated by the construction of Saint Joseph University's Campus of Innovation and Sports located next to the site. 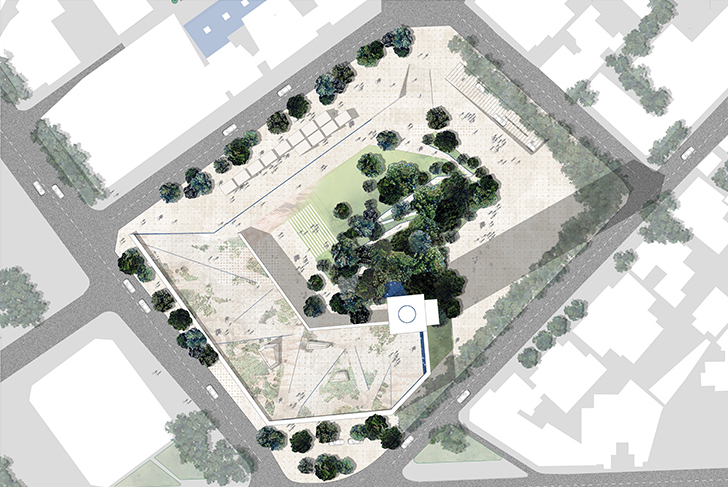 In addition, the project is located within a larger context of gardens, squares, and parks, all of which contain an abundant amount of Mediterranean vegetation, which will spatially connect to create a substantive network of green space crossing the otherwise densely built city. Currently, the site for the project is a parking lot, but the neighborhood park designed for BeMA will put the last piece of the urban network puzzle into place, enhancing and consolidating the larger swath of green space. A promenade leads visitors in a loop through a succession of varying landscapes. On the rooftop, the museum's belvedere has a fountain whose water flows into a small channel that winds down through the BeMA landscape alongside the visitors path. 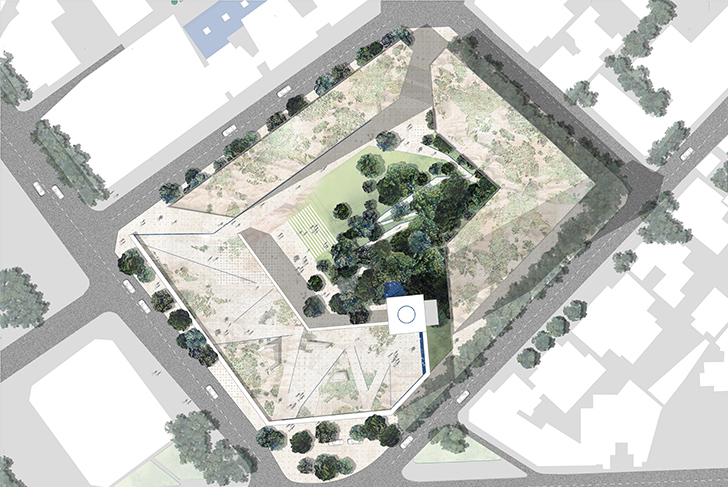 The design of the rooftop is directly inspired by the surrounding karst region: the pavement being made out of weathered limestone, it appears to have been slowly covered with scrubland vegetation. The walking path and the channel for water have been subtly carved out of the rough limestone surface. Local varieties of fragrant plants extend over some of the unevenness and cracks found in the rock surface. The channel for the fountain water functions as well as a runoff drain during heavy rain, conducting storm water downwards towards a retention pond located at the lowest point of the site. At street level, visitors come across an expansive, open space. Its hard surface in natural stone provides a conducive setting for all sorts of open-air activities and events related to the museum and Saint Joseph University. The walking path continues further down into a ravine-like landscape, with abundant hillside vegetation. Making its way in a meander down the slope, the path enters beneath a tree canopy made up of a number of local varieties such as stone pine, holly oak, Lebanese oak, strawberry, and olive. The canopy creates thick shade over the densely forested floor of shrubs. An amphitheater will be placed up against the slope, with the lower terrace of the museum becoming a stage, and its facade a large screen for projections. The water running down from the roof eventually leads into a reflecting pool located at the bottom of the ravine-like landscape. Luxuriant aquatic plants provide a perfect environment for contemplation and rest upon coming to the end of the part of the path leading through the garden. When the promenade continues, it loops around to reach the museum's lower terrace, allowing access to the entrance hall and an elevator that can take visitors back up to the roof and the fountain.